Hello from Orlando Florida. I am excited about learning with thousands of other educators at this amazing conference. 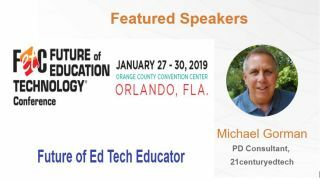 In the space below I have posted my contribution to FETC and promise you will walk away with some amazing ideas, resources, strategies, and future collaborators. Explore various models of PBL that allow for standards-based learning while facilitating the 4C’s. Understand how PBL can be the process and pedagogy for multiple initiatives, including 1:1, STEM, flipped classrooms, and student-centered learning. Investigate free resources that will help you take those first steps as a classroom teacher, school administrator, department head, or district leader. Walk away with amazing resources, wonderful connections, a wealth of new knowledge, and the desire to learn even more. Most of all, build the knowledge, enthusiasm, and passion necessary for you to take that next step.